The Lady Taverners held their popular annual charity golf day at Kenwick Park. With the help of their sponsors, Bluefin Insurance Services and N. T. Shaw of Louth, the event raised more than £3,700 which will be used to enhance the lives of local young people with special needs and from disadvantaged backgrounds. It is now 40 years since the Lord’s Taverners started funding specially adapted minibuses for schools who care for young people with learning and physical disabilities. To celebrate this anniversary, the Lord and Lady Taverners aim to provide 40 more minibuses this year to allow more pupils to engage in sport and recreational activities. The International Brigade team of Karen Archer, Dermot Dreelan, Steve Blackburn and Steve Ashby won with a great score of 88 points four points clear of the Spectrum Print team – Graham Cowley, Dave Chubb, Leslie Schofield and Wendy Green. Kenwick’s lady captain Penny Buckley, Jane Briggs, Pam Hayward and Dave Borman, A.K.A. Besoms and Bosoms, came third with 82. A countback on 81 points separated the last two prize-winning teams; Colin and Sue Burkitt playing with Dave Hallifax and Joan Fairbank (Guys and Dolls) were fourth ahead of Tracey Stobart and her team of Bill Wood, Wally Davies and Julia Labbett. 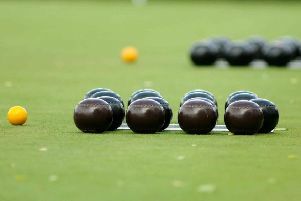 Dermot Dreelan won both the nearest-the-pin prizes for the men, and Karen Archer and Pam Hill won the ladies’ prizes. Yvonne Wood, the Lincolnshire regional chairman presented the prizes.